I would like this size envelope 12x15 in black. Is there anyway to have some custom ordered? 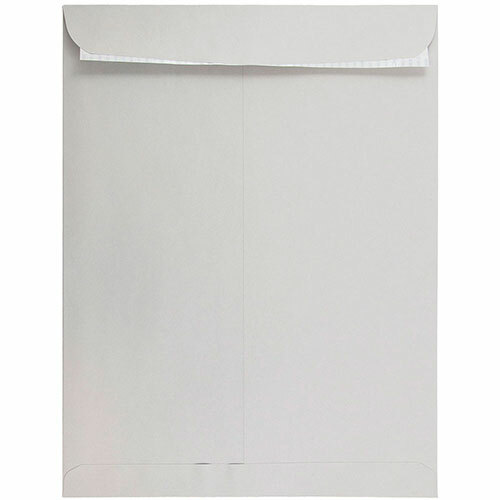 We unfortunately do not customize orders, but we do have a few other options of 12 x 15 1/2 envelopes: http://www.jampaper.com/Envelopes-BySize/12x155Envelopes. Hope this helps! Stay professional. Stay classy. With our Grey 12 x 15 1/2 Envelopes, you will surely keep those two traits under your belt. When you’re in need of a bigger size, but don’t want to cause too much of a stir handing them off, these are your perfect choice. The professional grey color allows you to keep interest but stay classy at the same time. The size is perfect for those larger documents you don’t want to ruin with a crease. From standard sized pieces of paper to legal size, our Grey 12 x 15.5 Envelopes will give your papers a professional look all the while giving them room to breathe. Maybe beauty isn’t pain after all! Grey 12 x 15 1/2 Envelopes are currently available in Light Grey and comes with a self-adhesive strip for a tight seal. Comes in packs of 500, these envelopes will be perfect for your business promotions, documents, or any other kind of endeavors your company will have!